is Pony Express still being produced? I haven't seen it for sale anywhere for quite a while. Perhaps the brewery only produces Flying Monkey now? A rendering of the J.D. Iler Brewing Company at Rochester and Montgall west of the Chestnutt Trafficway. 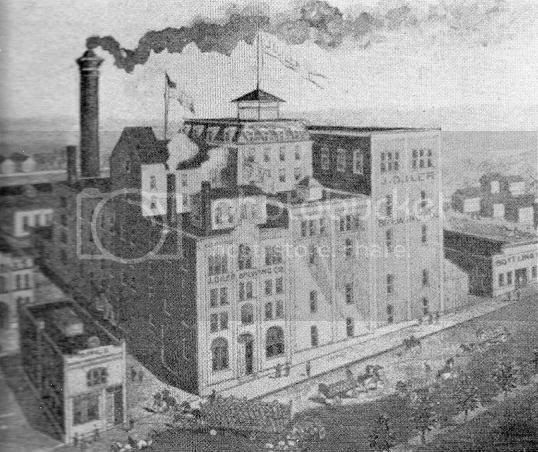 It was also called the Rochester Brewery, and was later merged with the Heim and Rochester breweries and the Imperial Brewery to become Kansas City Brewing Company. 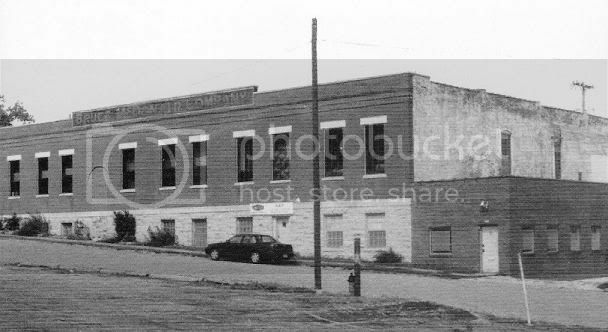 The former Iler plant was called Rochester 1, and the Imperial Brewery on SW Blvd. became Rochester 2. Last edited by FangKC on Mon Jan 21, 2008 5:01 pm, edited 1 time in total. 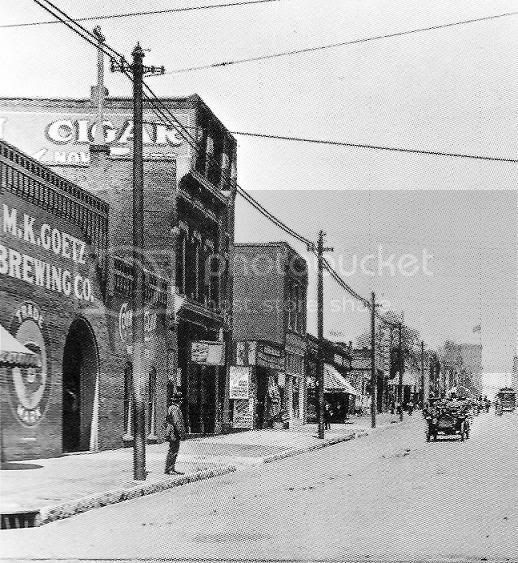 A Goetz beer distribution depot near 18th and Grand in 1909. 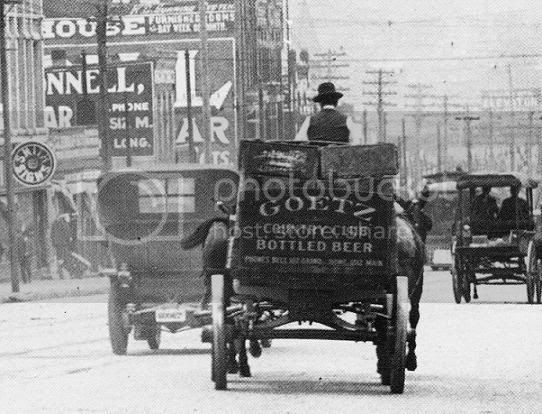 A Goetz beer wagon heading south on Main Street before Prohibition. Last edited by FangKC on Mon Jan 21, 2008 6:13 pm, edited 1 time in total. 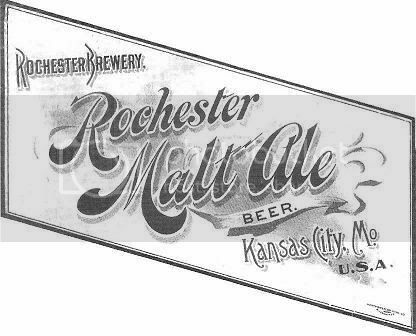 An advertisement for Rochester Malt Ale Beer. One of the former bottling buildings for Rochester Brewery at 20th and Washington. Last edited by FangKC on Mon Jan 21, 2008 6:59 pm, edited 1 time in total. If one goes back to the late 1800's and early 1900's it would have been almost impossible to transport on a regional basis let alone on a national basis any finished food or drink product. As inter-city roads and highways were improved and larger vehicles came into existence shipping of these products became more efficient and consolidation became more likely. The other reason was that raw grain was located nearby. Taverns serving Rochester, Schlitz, and Heim brand beers on the 1700 block of W. 9th Street in the West Bottoms. 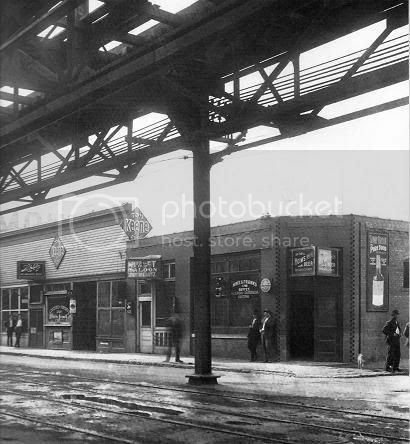 The photo also shows the 9th Street elevated rail line, and the Armour meatpacking plant sign in the background. 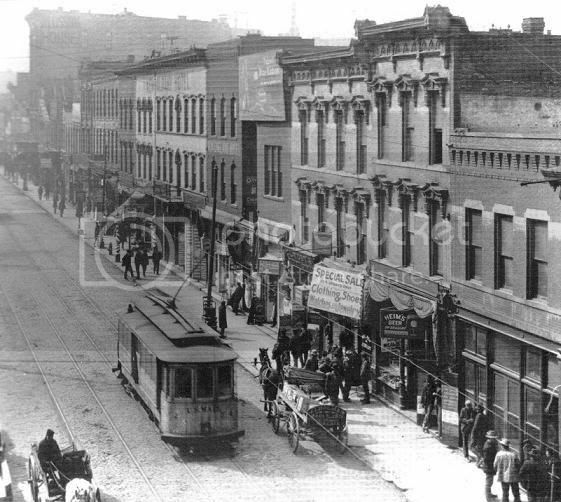 A 1900 photos shows retail buildings and taverns along Union Avenue in the West Bottoms, including a Heim-owned tavern. The Blossom House Hotel is the larger building in the distance. The New Albany Hotel was also down the street across from Union Depot. FangKC wrote: Yes, Boulevard is our only significant brewery. There a several brew pubs around the area that sell to their bar patrons and in some liquor stores. It's definitely the largest, but there's also Flying Monkey / Pony Express--pretty significant in that they do their own brews plus contracts for Breckenridge out of CO--and Weston Brewing Company, which is fairly big in the region. HalcyonKC wrote: Quite aside from any industry consolidation trend, wouldn't prohibition in the 1920's-30's have put an end to a lot of these companies? Guess it depends on the years in which they did business. Yeah, prohibition basically killed the regional beer industry in most cities, leaving only the largest producers of macrolager alive. The big boys made near beers and sodas and sold their yeast for bread; everyone else died out. Only just within the last 10-20 years have regional brewers come back to any level of prominence. And of course, now Bud's ads are all, "We are not some trendy microbrew! We are real beer!" Hrmf.